In this review, we’ll take a look at the ‘best frying pan‘ for glass top stoves and the ‘best pan’ for flat top stoves. 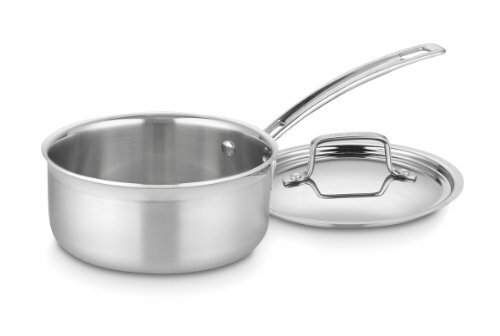 This duo from All-Clad comes with two frying pans, an 8-inch, and a 10-inch. They have a sturdy hard-anodized structure which gathers and holds heat evenly and quickly. The bottoms of these pans are bonded with stainless steel. This is to make them compatible with induction cooktops and to prevent them from warping. It’s also great for glass top stoves as it creates a gentle, non-scratch surface. The flat, non-warp bottoms sit firmly and evenly on glass stoves, creating an even and thorough heat distribution. The handles are made from stainless steel and are tightly riveted to the pan and contoured for a comfortable and sturdy grip. This is an important feature as it means you have total control over your pan as you move it to, from and around your glass top stove. If you love a good non-stick pan, you should strongly consider these pans. They’re coated with a PFOA-free nonstick coating for fat-free cooking. This also makes them easy to clean, as leftover food simply wipes away. These pans are oven-safe (up to 500 degrees Fahrenheit). First things first, this is a pricey frying pan, there’s no getting around that fact. However, when you look at the design details and quality of materials, the price makes sense. It’s made from a very sturdy 5-ply construction of stainless steel and aluminum, with copper as a thick core. This combination of metals makes for extremely efficient heat conductivity and even distribution. It isn’t non-stick per se (it doesn’t have a non-stick coating), but it is stick-resistant when used correctly (i.e. don’t put cold meats onto a hot pan!). The stainless steel exterior is gentle and won’t scratch, mark or stain your glass cooktop. 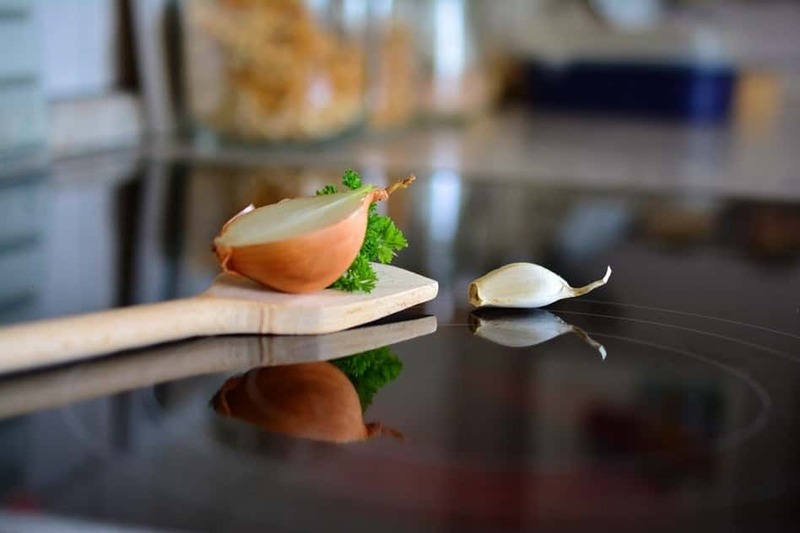 The durability and toughness of the materials mean this pan will not warp, allowing it to sit firmly and evenly with full contact with your glass cooktop. This is a crucial feature, as warped or uneven pans are a nightmare to use on flat stoves! This pan is compatible with all cooktops, including induction, and is oven-safe up to an amazing 600 degrees Fahrenheit. It has a stainless steel handle which is firmly riveted to the pan so you can move the pan around your glass stove with complete control. The edges of this pan are flared so you can pour liquids easily if need be, and plus, it looks classy! An extremely long-wearing, versatile and attractive frying pan which will go perfectly with any glass stove. And now for a far less expensive, yet still very impressive option. This frying pan is from T-Fal and is made from heat-conductive hard-anodized aluminum. The flat, sturdy base is ideal for glass stoves as it won’t scratch the glass, and it will sit firmly and flatly on the heat. The TechnoResist base provides even more prevention against warping, which is just the quality we look for in a pan for glass stoves. This frying pan is perfect for anyone who requires a non-stick frying pan, as the interior is coated with a PFOA-free nonstick coating. The handle is awesome too, as it’s covered in silicone and riveted firmly to the pan. This means you can get a cool-touch, strong and steady grip on the pan when handling it over your glass stove. And yes, it has that T-Fal Thermo Spot Heat Indicator to help you to make sure your pan is preheated every time. It’s also oven safe, which is always handy when keeping food warm or adding that extra blast of heat. A great pan for anyone with a glass stove, a small budget and a preference for nonstick cookware. 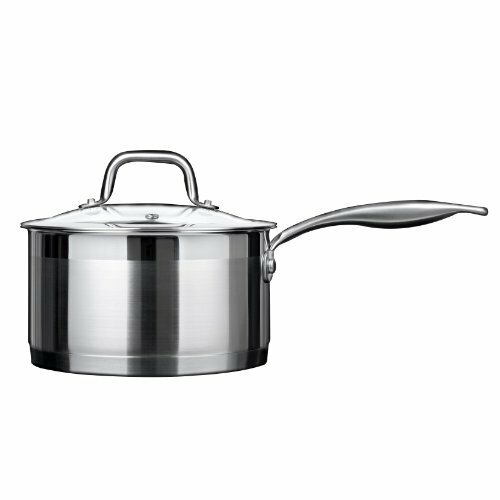 This tidy-looking saucepan from well-loved brand Cuisinart is ideal for flat top stoves. It is made from aluminum and stainless steel. The core of the saucepan is aluminum, which we love as it’s great at conducting heat quickly and evenly. The double layering of metals makes for a sturdy, heavy construction which is what we need for flat top stoves. The stainless steel exterior is perfect for flat stoves as it is smooth and won’t scratch, melt or stain the cooktop. The bottom of the saucepan is heavy and totally even, so it will come into full contact with the element, resulting in even heat distribution. This attractive saucepan comes with a stainless steel lid which fits snugly to keep heat and moisture in when required. 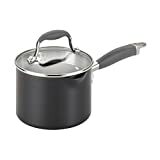 The price of this saucepan is impressive considering the quality of materials and the versatility (induction-compatible, oven and dishwasher safe). A great small-medium saucepan for flat top stoves, small budgets and an eye for aesthetics. This saucepan from Anolon has some amazing features as well as being extremely suitable for flat-top stoves. The bottom is heavy, flat and even to sit firmly and in full contact with your flat cooktop. The hard-anodized construction conducts heat evenly and efficiently while remaining hard-wearing and durable. The bottom of the pot is smooth and won’t scratch or discolor your flat-top stove. If you’re into non-stick cookware, you’ll love this one as the hard-anodized base is topped with a non-stick coating. You’ll like the handle on this saucepan, as it’s made from stainless steel with a silicon coating for cool, easy, and firm grip. 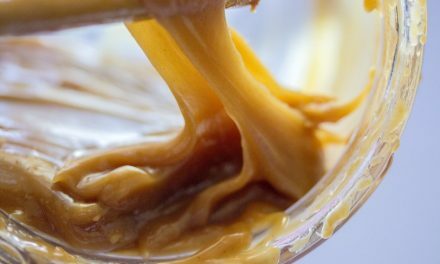 The glass lid which comes with the saucepan has the same handle, as well as shatter-resistant glass. The lid has a little cluster of holes for straining liquids out of the pot, (optional and very handy!). There is also a pouring spout on the side of the saucepan for spill-free pouring. 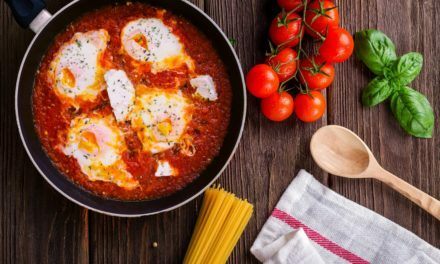 You’ll love this saucepan if you want something spill-proof, non-stick, oven-safe, hard-wearing, smooth and even-bottomed for perfect flat-top stove suitability. The price from Anolon is great too! This shiny saucepan comes from a lesser known brand, Duxtop. We love the construction, made from stainless steel with a “heavy gauge impact bonded encapsulated aluminum” bottom. This is a good benefit for flat top stoves as it sits steadily and evenly on the cooking surface, maintaining contact with the heat. This saucepan won’t move around, slip or scratch your flat stove, it will sit there firmly until you move it. The stainless steel used is high-quality commercial grade steel. 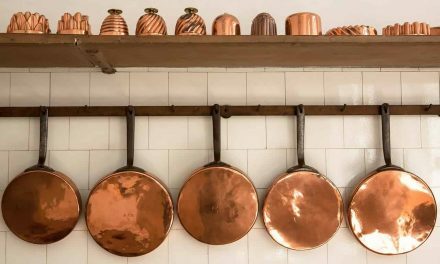 We love how versatile this saucepan is. It’s compatible with all cooktops including induction and is oven-safe up to a whopping 550 degrees Fahrenheit. The handle is pretty awesome, with an ergonomic shape and a brushed, anti-slip finish for steady, controlled handling. 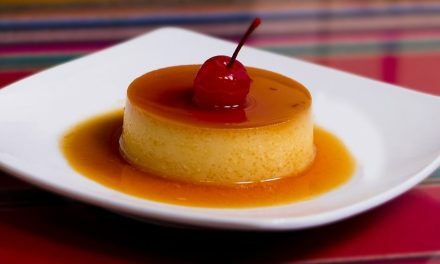 The glass lid is handy for keeping an eye on your food as well as locking in moisture and heat. 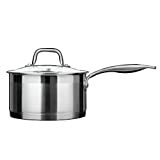 This 2.5-quart saucepan is perfect for flat cooktops and will serve you well for a very long time. Perfect for you if you love a stainless steel finish, oven-safe capabilities and a heavy, non-scratch bottom for sitting firmly on your flat cooktop. The flat top stove required certain characteristics from a pan. We’ve interviewed some of the best that meet these characteristics. We hope this review helped with your decision!